The Nebraska baseball team hosted its annual Fan Fest on Friday at the Hawks Championship Center. Nearly 1,000 fans came out to participate in games, get autographs and to support the team. After finishing the 2018 season 24-28 overall (8-14 Big Ten) and missing the Big Ten baseball tournament, both fans and players are ready to turn things around and get the 2019 campaign underway. The team is ready to get healthy arms back in the lineup after injuries made a significant impact last season. There will also be many new faces on the roster, including some talented freshman that made up the No. 1 recruiting class in the Big Ten (No. 16 nationally). Some fans in attendance at Fan Fest on Friday shared their thoughts and expectations on the upcoming season, like Bryant and Marilyn Beckman from Lincoln. 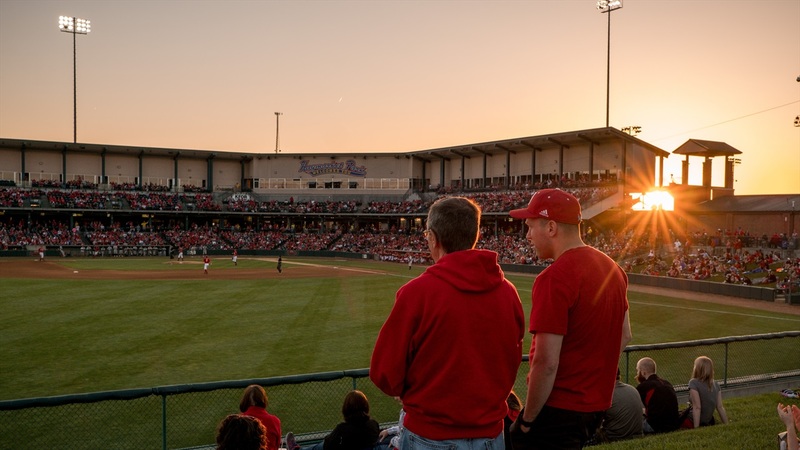 Both are long-time Nebraska baseball fans and have been season ticket holders for four years. Bryant attended every single home game last season. Both Bryant and Marilyn attended games in the fall and liked what they saw on the mound from the pitchers. “It looks like the team overall is going to have more depth and I expect Nebraska to have a much better season this year,” Bryant said. He’s not wrong either. Depth is something Nebraska is going to have to improve, especially after losing guys like Jesse Wilkening and Scott Schreiber. Fans weren’t the only people in attendance on Friday. Quite a few parents and family members showed up to support the team and their start to the season. Rick Kissack (father of pitcher Trey Kissack, who tranferred last summer from the Hastings Sodbusters) was one of those in attendance. Making the trek from Grand Island, Rick spoke highly of the freshman recruiting class. “[They] brought in some really good freshman arms and I expect them to compete early,” he said. Rick also mentioned the first priority is “making the Big Ten tournament” this season, which is a goal that clearly extends beyond just the team. Most fans seemed optimistic for the 2019 season, even after a disappointing season last year. Ryan Kronberg, who hails from Stromsburg, Nebraska, is expecting a nice bounce back. While he felt last season was “a tough year to watch,” he’s looking forward to a promising freshman class in 2019. He also joked that he hopes Mother Nature cooperates so he has to endure a few less cold games this spring. While fans enjoyed Friday’s festivities, Nebraska’s staff did their best to ensure all in attendance had a good time. Abby Erickson, who works with the Nebraska marketing department, was grateful to help host a family atmosphere. Coach Darin Erstad also addressed the crowd for about 30 minutes and introduced many of the new faces. He talked specifically about how this team is full of fighters. At the end of his time addressing the crowd, Erstad had only one thing left to say. “These guys are going to be fun to watch,” he said. Nebraska opens the regular season on Feb. 15 in California at UC Riverside.